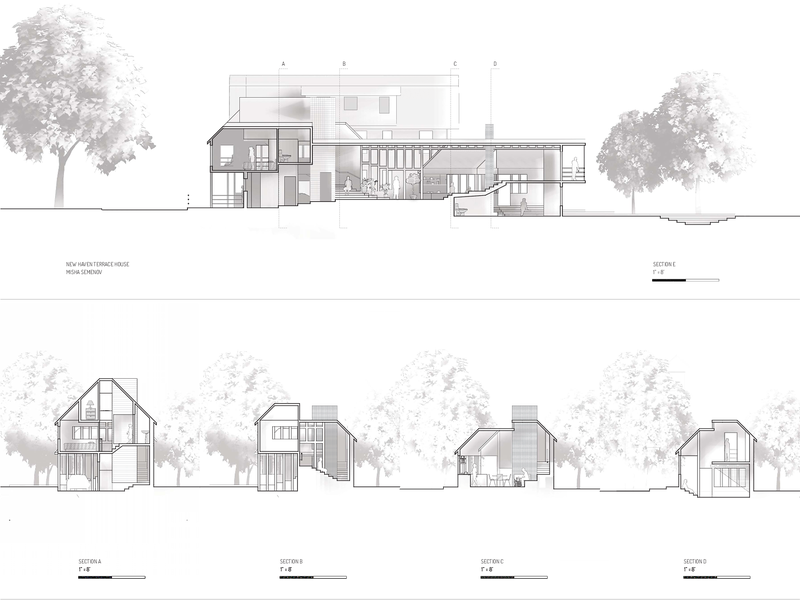 This project investigated how a house in the urban context of New Haven can give its inhabitants a deeper connection to nature, in particular to landscape and sunlight. Winter shading issues led to the development of a “barbell” schame, with the house split into two wings, each anchored by a vertical element and featuring a porous southern edge open to the sun. 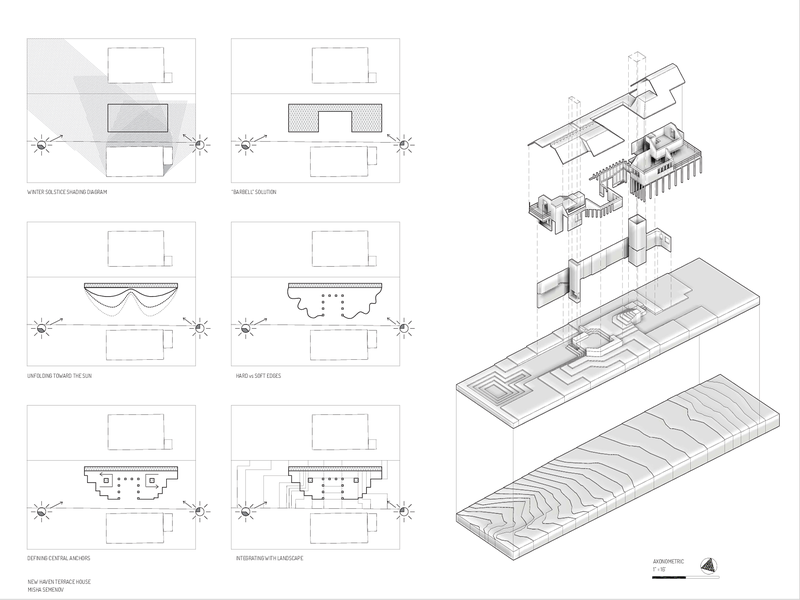 The landscape strategy was to harness the existing topography of the site by terracing it with 6” stepped contours that flow seamlessly into the interior of the house. The circulation within the house is a product of this exaggerated topography; the stairs become extensions of the stepping of the landscape. The “drawdel” shown above was a further investigation of the connection between interior and exterior enabled by the project’s landscaping strategy. 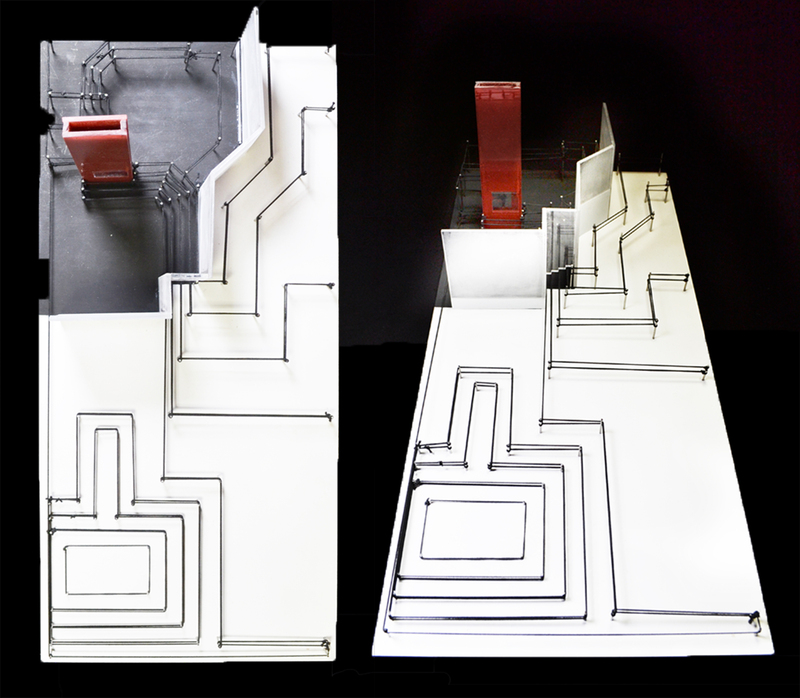 The model focused on a special feature of the house design, a floor-to-ceiling window that reveals the continuity between the interior stairs and exterior terracing. The black string represents these terraces; the white paint represents the outside, while the black paint designates indoor spaces. Ultimately, the aim of the drawdel is to ask to which of these realms the terracing belongs. On the one hand, the terraces can be thought of as the natural landscape flowing into the manmade space of the house through the trans- parent window. Or is it, on the other hand, that the rigid geometry of the terraces is flowing out from the rectilinear house into the sinuous curves of the landscape, straightening them out and “denaturaliz- ing” them in the process? 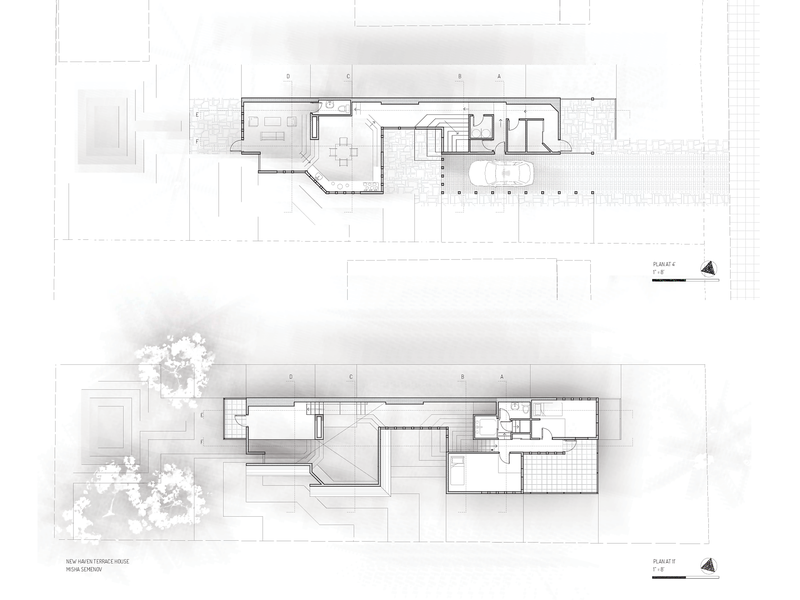 The drawdel connects the project to a larger discourse about the natural and the manmade in architecture.